Ash, ash veneered plywood, olive ash, sycamore and lacquered. 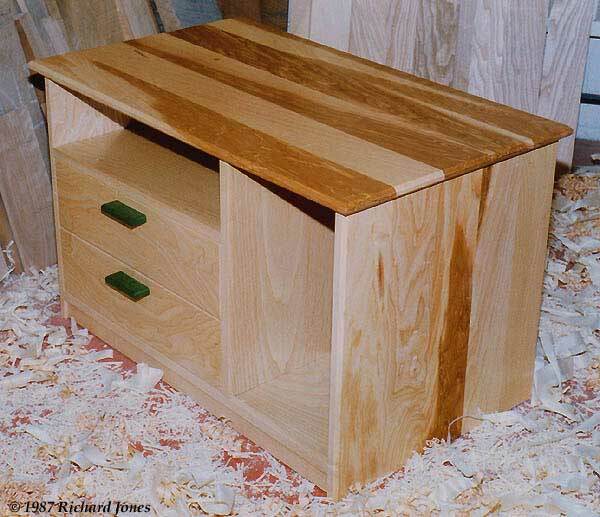 Bookmatched solid wood planted drawer fronts on sycamore drawer boxes carried on side mount drawer slides. Wooden drawer pulls dyed green. Private Commission to carry a television, videos and general storage. Dimensions: H 560 X W 850 mm X D 460. (H 22" X W 33-1/2" X 18-1/8"
Guide Price: £1500 and up, depending upon specifications.